We aren’t kids anymore, but that youthful fire still drives us. It’s the joy of dedicating our work days to something we fiercely love doing: designing, building and maintaining luxurious outdoor living spaces. That spirited optimism is something you will notice about all of our team members. If you happen to drive past one of our crews at work, it’s pretty likely that they will wave and smile. Naylor is a locally owned, family run business. That means we’re friendly, accessible and reliable. This is personal for us. We’ve built our business on lasting relationships. Many of our clients today have been with us since we started over 30 years ago. There must be a reason for that. Barney Naylor learned the first rule of landscaping as a kid pulling weeds in his father’s garden for 25-cents a bag. He learned that the foundation of landscaping is diligence and hard work. That’s why the Naylor family always had the best-kept yard on the street. While studying biology at Western Michigan University, Barney developed an understanding and deep appreciation of the ecology that supports living systems. Joy, hard work, love, and an appreciation for living systems—those themes run through our landscaping company today. Combined with our decades of field experience and commitment to continuing education, we are strongly positioned to be your single source for landscape design and construction, and expert landscape management. In addition to our commitment to serving our customers and self-improvement, we believe in helping out in our community. Naylor Landscape Management donates time and materials to Habitat for Humanity, Hospital Hospitality House, Wings of God, Trout Unlimited and local charities every year. 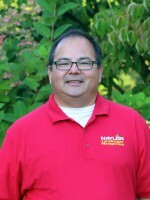 Learn more about Naylor Landscape Management!